The First World War was instigated by the assassination of Archduke Franz Ferdinand, but it’s no small miracle that a general European war didn’t happen earlier. Here are 7 international crises in the years before 1914 that could have started a global-scale conflict. For most Europeans, the century leading up to the First World War was peaceful and prosperous. After the fall of Napoleonic France, European people busied themselves with science, art, and industry. And when war threatened, the Concert of Europe—with its emphasis on a power balances and diplomacy—managed to avert war time and time again. Starting in 1875, Europe began to experience a series of crises, each threatening to uproot the longstanding peace. Here are the most serious of these incidents, listed chronologically. A general war in Europe nearly erupted 50 years before the First World War, a conflict that would have bore a startling resemblance to the global conflagration that emerged a half-century later. Four years after the German victory in the Franco-Prussian war and its establishment as a unified nation-state, the upstart Empire began to meddle in the international affairs of its main rival, the newly founded Third Republic of France. Its crafty chancellor, Otto von Bismarck, worked to contain its neighbor to the west by pressuring for and supporting the election of liberal and republican-minded governments in Belgium, Spain, and Italy. But Bismarck’s containment policy flew off the rails in 1875 after an editorial in a German newspaper titled “Krieg-in-Sicht” (German for “War-in-Sight”) suggested that some highly influential Germans—worried about France’s rapid recovery from defeat—were planning a so-called preventive war against France to tame it back into submission. The editorial prompted a war scare in not just Germany and France, but also in Britain and Russia, whose leaders made it abundantly clear that a preventative war would not be tolerated. Adding to the tension was the fact that Britain was already nervous about the presence of a powerful new nation in Central Europe—a force that was beginning to upset the balance of power on the continent. Cooler heads prevailed, but it was a crisis that alerted European leaders to the new and intensely fragile geopolitical dynamic. Perhaps paradoxically, this international incident, in which France and Britain nearly went to war over a small and obscure patch of land in Africa, actually brought the two historic rivals closer together; the Fashoda Incident was the seed that sprouted the Entente Cordiale. In 1897, in one of the last gasps in the Scramble for Africa, a French force made its way to Fashoda (today Kodok), a small village located 1,600 miles (2,580 km) due south of Cairo along the Nile. At a time when prospective African colonies were scarce, the French were attempting to expand from West Africa along the southern border of the Sahara Desert, while the British were trying to reinforce its solid block of influence through Southern and East Africa to Egypt. Fashoda was located both literally and figuratively at the intersection of these interests, giving rise to the crisis. In response, Britain sent its own force to claim the territory for itself (an expedition that included Winston Churchill as a war correspondent), which it did so with relative ease. But the incident caused turmoil in Europe. French newspapers proclaimed, “No Surrender to England,” while papers in Britain declared an unwillingness to fall for French tricks. Thankfully, the two countries managed to avoid a war on the European continent, which would have undoubtedly led to a wider catastrophe. Russia, which signed a secret peace treaty with France in 1894, would have been compelled to come to France’s rescue—a move that most certainly wouldn’t have been tolerated by Germany, and possibly Austria-Hungary (which was establishing closer ties with Germany while moving away from Russia). But in the end, Britain and France showed that they weren’t willing to go to war over African colonies, and that their country’s best interests were best served within an alliance. With Russia embroiled in a war with Japan, some European nations wondered if they could exploit the situation, while others worried of growing Russian influence abroad. At the dawn of the 20th Century, Russia figured that its future was in the East rather than West, compelling it to go to war with the up-and-coming Japanese Empire. The two nations had endured several years of disputes over Manchuria, culminating in a Japanese surprise attack on the Russian fleet at Port Arthur, a strategic warm water port. Russia would go on to lose the war in what was both a national and international embarrassment. During the course of the year-and-a-half war, however, the world sat on edge as the two great powers battled it out in an effort to control areas of China and Korea. Austria-Hungary seriously contemplated an invasion of Russia while its hands were tied in the East, but it decided to focus its concerns on Italy instead. France, though technically Russia’s ally, managed to stay out of the conflict. Had it joined in, however, the move would have compelled both Britain and Germany to respond. Britain, meanwhile, was concerned about Russia’s newfound stake in Asian affairs. During the Russo-Japanese war, some Britons were genuinely concerned that their country would be dragged into the conflict. Frighteningly, on October 21, 1904, this almost happened. While en route to the Pacific Theatre, a nervous Russian fleet fired cannons at British fishing vessels thinking they were Japanese ships. In the confusion, some Russian ships even fired upon each other. Three British fishermen died and a host of others were wounded. The episode, now called the Dogger Bank Incident, created a tremendous uproar in Britain, and some feared that war between the countries was iminent. Again, cooler heads prevailed. Not until the troubles emerged in the Balkans would Europe come closer to a general war than it did during the First Moroccan Crisis, also known as the Tangier Crisis. In a moment of either tremendous daring or inexplicable stupidity, Kaiser Wilhelm II of Germany—egged on by his chancellor, Bernhard von Bülow—landed at the Moroccan city of Tangier and met with representatives of Sultan Abdelaziz. It was a gesture that threatened French influence in Morocco. 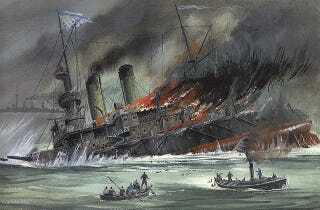 The incident sparked an international crisis that lasted from March 1905 until May 1906. I do not acknowledge any agreement that has been come to. I come here as one Sovereign paying a visit to another perfectly independent sovereign. You can tell [the] Sultan this. The Tangier visit sparked a major international crisis with talk of war between Germany and France, along with the distinct possibility that Britain might join in on the side of France. British Admiral Jackie Fisher, who was concerned that Germany was after a port on Morocco’s Atlantic coast, said it marked “a golden opportunity for fighting the Germans in an alliance with the French.” At the height of the crisis, the rumors of war in France were so serious that men purchased vast quantities of socks and boots in preparation for mobilization. The French even cancelled all military leave. Germany, stubborn to the last, threatened to sign a defensive alliance with the Sultan. War seemed all but certain. Eventually, the Algeciras Conference was held to settle the dispute. Of the 13 nations present, only Austria-Hungary supported Germany—an ominous sign of things to come, and further evidence for the Kaiser that Germany was being “encircled” by its enemies. In the end, an agreement was reached in which France relinquished its control of the Moroccan police, while still maintaining control over Moroccan politics and financial affairs. It was a diplomatic setback for Germany, one that made its leadership look unresolved and weak. Like Fashoda, this was a seemingly minor incident that had the potential to escalate dramatically. Austria-Hungary’s annexation of Bosnia-Herzegovina on October 6, 1908 marked one of the most dangerous episodes in European history prior to the onset of the First World War. Though outright war was avoided, the annexation was a move that convinced many European foreign experts and leaders that war was coming—and their preparations entered into a new phase of added urgency. Owing to the decline of Ottoman influence in the Balkans, some European nations sought the opportunity to make their move in the region—but time was of the essence. Panslavic sentiments began to emerge, as witnessed by the increasing calls for a kingdom of southern slavs. Serbia in particular, with its nationalist proclivities, began to assert itself in the region. It did so confidently knowing that Russia, another slavic nation, had its back. At the same time, the rise of the Young Turks created uncertainty about Ottoman presence in the Balkans. Austria-Hungary, meanwhile, was growing increasingly wary of what it saw as not just Serbian meddling in the Balkans, but also Serbia’s efforts to rouse unrest in neighboring regions, including Bosnia-Herzegovina, which had a sizeable Serbian population. After some suspicious back room dealings with Russia, Austria-Hungary annexed Bosnia-Herzegovina—a territory formally within the sovereignty of the Ottoman Empire—a move that instigated a serious international crisis. The annexation happened near the same time that Bulgaria declared its independence from the Ottoman Empire. Russia, suddenly dissatisfied with the annexation, sought reparations that never came, causing the nation to look isolated and weak. It was a diplomatic victory for Austria-Hungary, one settled as a fait accompli with the Treaty of Berlin. But the damage was done; Russia was determined not to back down again, while Serbia, who perceived the annexation as an encroachment onto territory it wanted for itself, had more reason to hate Austria-Hungary. Also known as the Second Moroccan Crisis, the Agadir Crisis threatened the fragile peace in Europe once more. In 1911, the Kaiser sent the warship Panther to Morocco to protect German nationals (which turned out to be a lone person). But at another level, the move was interpreted as way to prevent ongoing French influence in the region. And indeed, the French were violating previously established accords. At the same time, the Kaiser was also testing the strength of the newly established, but informal, alliance between Britain and France. As France and Britain contemplated their next moves, the threat of war caused a financial crisis in Germany; stocks plunged by 30% in a single day, and the public started to cash in currency notes for gold. “It is disconcerting in light of what was to come how jittery Europe was and how readily the possibility of war was accepted in what was after all a colonial dispute capable of being settled relatively easily by international agreenment,” writes MacMillan. The Agadir Crisis backfired against the Kaiser. The Entente did not break. France was emboldened by British backing, with ripple effects through the Franco-Russian alliance when the Serbian crisis came in 1914. Yet Agadir also proved a curse for Britain. It fed an overwhelming sense of fury in Germany, a feeling that Britain had become an enemy. Hopes of heading off the cataclysmic clash that was come in August 1914 ebbed away. It is a stretch to date the First World War from Agadir, but not a big stretch. On November 4, Germany and France resolved the conflict by signing the Treaty of Fez, in which Germany accepted France’s position in Morocco in exchange for territory in what is now the Republic of Congo. Taken individually, each of these crises was clearly not enough to start a global war, but their effects were cumulative. Following the Bosnian Crisis, the Balkan region experienced two wars, one from 1912-13, the other later in 1913. But it would be the assassination of Archduke Franz Ferdinand and the rapid escalation of the Third Balkan War that finally ended peace in Europe. Email the author at george@io9.com and follow him at @dvorsky. Top image: The Russian battleship Admiral Ushakov is going down after heavy fighting during first day of Tsushima battle. Painting by V. Emyshev.